To promote measures against global warming based on the Paris Agreement, and to ensure transition to decarbonised societies, it is important to link long-term targets/strategies with short- or mid-term concrete policy targets. As of August 2017, 155 “Nationally Determined Contributions (NDCs)” were submitted to UNFCCC (from 182 countries). In 2015, the 2030 Agenda for 17 Sustainable Development Goals (SDGs) were adopted. The climate change is one of the most crucial and urgent SDGs. This is because current actions will have a profound and everlasting influence on the future of the environment as well as the human race. 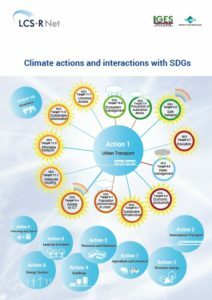 Moreover, many actions aimed at tackling climate change will also help achieve other SDGs – such as ensuring access to affordable clean energy and building resilient infrastructure. 3) synergies and trade-offs between certain measures and SDGs. It also aims to share information contributing to attaining and improving NDCs in the future, and will call for further discussions. Please visit the link below for the further information.